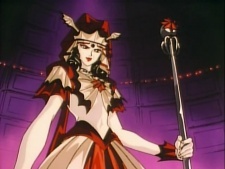 Queen Badiane was the villain of the Sailor Moon SuperS movie. She was a witch from another world who planned to kidnap children and bring them to Marzipannu Castle, where she would seal them in Dream Coffins and use the energy generated by their dreams to power her Black Dream Hole. Her purpose was to grow the Black Dream Hole large enough that it would swallow everything, putting it under her control. She enlisted the aid of four fairies, Perle, Poupelin, Banane, and Orangeat, for help in this endeavor. When Chibiusa was captured and brought to the castle, Badiane realized that she was an extremely good source of energy and determined to use her to finally open the Black Dream Hole. The other Sailor Senshi came to the castle to rescue her, however, and Sailor Moon and Sailor Chibi Moon eventually destroyed Badiane with a combined Moon Gorgeous Meditation.